The Travels of John Prideaux 1900. Liverpool to Cornwall. 2.30pm After lunch we three again went again to see more of the City while the two Mrs Prideaux spent the afternoon at home together. 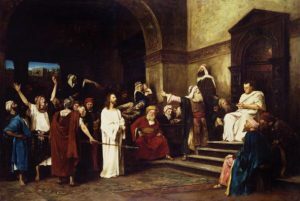 We visited first the Art Gallery where we saw Christ before Pilate in oil painting life size. There were seventy figures in all. How vivid? How life like they appeared to me. It is impossible to express my feelings at that time as I stood and looked at those enemies and friends of Jesus. We spent one hour in the Art Gallery. I then bought me a silk hat and we returned to Capt. Prideaux. After Tea, we sat around and told of our journey and of the years gone by. Capt. Prideaux and his daughter, Mamma, Arthur and I went to the Presbyterian Church at 11 am and came home through Stanley Park. After a roast beef dinner, we took Car for Sefton Park at the extreme south of Liverpool with Capt. and Mrs Prideaux. It had a beautiful Palm House made of iron and glass inside of which was a gallery reached by winding stairs. Capt. Prideaux, Arthur and I at 10 am took Car to Haymarket and to the YMCA and called at Miss Prideaux’s Store and from there to the overhead Electric Car from the Dingle to the Seaforth line of Docks said to be nine miles. Then back to James Street and to Central Station where we meet the two Miss Prideaux’s as agreed and went to the Kirkland Restaurant and had luncheon together at one pm. From there we all went and boarded Ferry Boat to New Brighton on the Mersey Waters, a 15-minute ride. At Brighton, we visited Capt. Prideaux’s sister in law Mrs Robinson where we had tea together about 5 pm. We left there at 6.35 after a pleasant visit and took Ferry for the same wharf we started from. The two Mrs Prideaux’s took Car for Capt. Prideaux. Arthur went to the Mersey Tunnel and I with Capt. Prideaux went to Ticket Office to see about tickets to Cornwall and then went to Captain Prideaux to rest for the night. During the day, we saw many beautiful and wonderful sights. 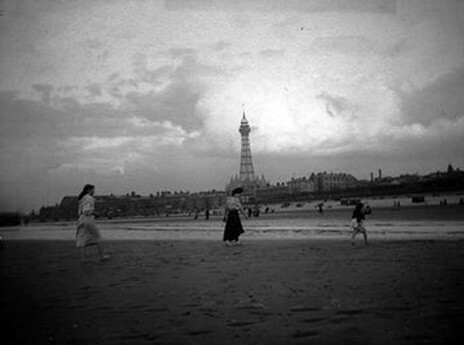 New Brighton Tower built of iron and steel was a grand sight from two to three hundred feet high. The House and furniture at Mrs Robinson’s were elegant and Mrs Robinson a very pleasant lady. Capt. and Mrs Prideaux entertained us royally from Saturday 7 am till Tuesday 15th May when we left at 10.30 am for Cornwall. The two Miss Prideauxs, Bertha and Lillie did their best to make us at home. Sunday evening May 13th Lillie played the piano and Bertha sang before we retired. (I had a cold.) Capt. Prideaux and his daughter Lillie saw us leave on the train on the 15th for Cornwall. Arrived at Bristol 3.45 pm and left 4.10. The weather was good from Liverpool to Bristol and while in Liverpool. At 4pm we went through a long tunnel under the Severn River. At 6pm we arrived at Exeter and stopped at Elmfield Hotel.